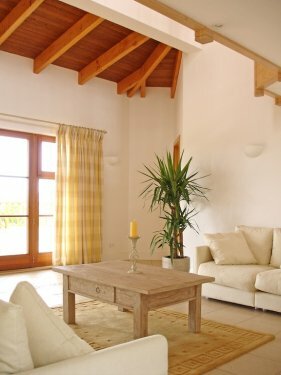 In a superb position on a large (1,285m2) plot, a highlight of this villa is the sheltered inner courtyard, which, together with permeability of the living spaces, gives the villa a tremendous feeling of space and light. Arches lead from the hallway to the large kitchen and open-plan dining area, with arches also leading to the spacious main living area. 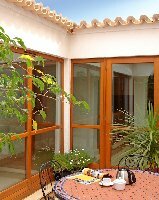 Patio doors from the living and dining areas lead out to a partly shaded, balustraded southerly terrace, perfect for al fresco dining. 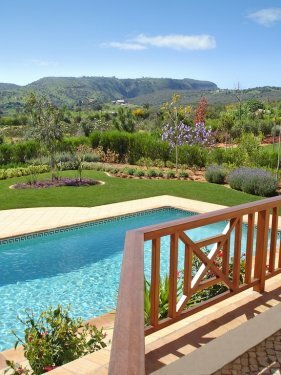 Steps to either side of this terrace then lead down to the pool terrace and large, heated pool, all set within mature, gated Mediterranean gardens affording total privacy, and with spectacular, uninterrupted views across the Burgau valley to the coastal hills. Over the living area, accessed by a concealed stairway, is a gallery with access to two southerly roof terraces, oriented to enjoy the sun at different times of day. 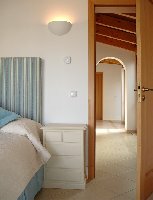 Accommodation includes three double bedrooms, two with en suite facilities, and a study, off the main living area, with a double sofa bed for additional sleepers. A third shower room serves the adjacent third bedroom and study. 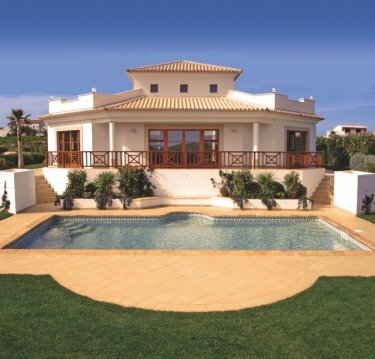 This is an idyllic location for a luxury holiday. Living Room, partly double-height, with 4-seater and 3-seater leather sofas, LCD TV with 40+ cable channels: 25+ in English, DVD, B&W Zeppelin iPod player. Dining Room with dining table and 6 chairs. Patio doors from the living and dining areas open onto the main terrace, with external seating and dining, 8 sun loungers, BBQ. Steps down to pool terrace and private heated swimming pool with saltwater chlorinator and cover. The gallery floor is accessed via a concealed timber stairway from the main living area and provides an additional attractive living/play space, currently furnished with 2 x bean bags, there is access from the gallery to south-east and south-west facing roof terraces. 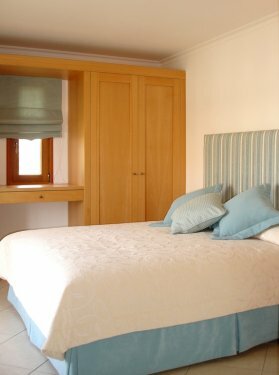 AlmaVerde village is situated on a 58 hectare rustic setting among mature oak, pine and carob trees at the gateway to the Costa Vicentina Natural Park. The site enjoys an elevated position with sweeping views over the surrounding countryside. 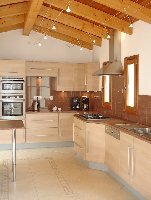 To the North, the site overlooks the traditional village of Bar�o de S�o Miguel, and to the South, the Burgau valley and coastal hills. The beach at the picturesque fishing village of Burgau is just three minutes by car (2km), while the historic port of Lagos, with its colourful markets, attractive marina and vibrant nightlife, is only ten minutes away (<10km) and hosts over 100 restaurants.